All artificial cardiac pacemakers have a pulse generator (a device that gives off an electrical impulse at prescribed intervals), electrical leads (which transmit the impulse to the myocardium), and a battery (usually made of lithium iodide) encased in titanium and implanted surgically in a subcutaneous pocket (usually in the chest). The pacing leads are threaded through a subclavian vein into the right heart, with the primary lead placed in the ventricle, and the second lead (if required) in the atrium. For biventricular pacing, a third lead is placed in the left ventricle. A biventricular pacemaker also may have a built-in cardiovertor-defibrillator. Pacemakers typically have the ability to pace the ventricle, the atrium, or both; to sense electrical discharges coming from cardiac chambers; and to respond to sensed beats. Most pacemakers in the U.S. also are programmable, and many are rate responsive. The features of each pacemaker are identified in its three- to five-letter NASPE/BPG code (developed and revised by the North American Society of Pacing & Electrophysiology and the British Pacing & Electrophysiology Group). The five positions describe the pacer's functions as follows:1. Chambers paced (O=none, A=atrium, V=ventricle, D=dual [atria and ventricles], S=manufacturer's designation for single [atrium or ventricle]; 2. Chambers sensed (O=none, A=atrium, V=ventricle, D=Dual, S=Single; 3. Response to sensed event (O=none, T=triggered, I=inhibited, D=dual [inhibited and triggered]; 4. Rate modulation (O=none, R=rate modulation in response to sensor technology; 5. Multisite pacing (O=none, A=atrium, V=ventricle, D=dual [atrium and ventricle]).Thus a pacemaker with the letter I in position 3 of its code will inhibit firing when it senses an intrinsic beat but will pace the cardiac chamber if no beat is sensed. The letter D in position 5 indicates that both atria and both ventricles are paced, with the left and right chambers stimulated simultaneously to maintain coordination and thus improve cardiac output. When the pacemaker has a rate modulation feature (R in position 4), also known as an adaptive rate mechanism, it works to copy the abilities of a normally functioning heart, such as detecting exercise and triggering pacer rate acceleration to meet the increased metabolic need. Other pacemaker features include hysteresis, which delays unnecessary pacing (which can harm the right ventricle), and allows the patient's intrinsic impulse to provide an atrial kick, which stokes the ventricle and increases cardiac output by 15% to 30% over a beat without atrial kick. Pacers with a “rate-smoothing algorithm” limit heart rate changes to a programmed percentage from one beat to the next, allowing the heart rate to increase or decrease more slowly and providing time for the body to adjust the stroke volume as it would normally in such situations. After pacemaker implantation, follow-up care is provided to ensure that the device is working optimally. A chest x-ray confirms correct placement of the leads and also can identify some complications, such as pneumothorax. Since pacemakers usually are implanted under moderate sedation and analgesia, the patient may still be drowsy on return to the unit from recovery; however, he/she should arouse easily and be able to answer questions and follow commands. Supplemental oxygen is provided (nasal cannula or mask) until the patient is fully awake and his/her oxygen saturation has returned to baseline. Immobilizing the patient's shoulder and arm on the operative side with a sling or ace-wrap for 24 to 48 hr limits movement that could dislodge the tip of the pacing electrode(s) from the endocardial wall, preventing sensing of intrinsic beats or needed pacing. The incision is assessed for bleeding, infection, and incisional discomfort, which is controlled with prescribed analgesia. The patient also is assessed for chest pain, palpitations, dizziness, shortness of breath, hiccuping, and a sensation of pacing in the abdomen, and the cardiologist or surgeon notified if any of these occur. The chest x-ray usually is repeated the following day to document positioning and rule out pneumothorax. Pacer function is checked, and the patient discharged with instructions for activity restrictions and further care. Follow-up care typically includes monitoring the pacemaker's performance, either in the cardiologist's office or by telephonic link-up to ensure, for example, that the pulse generator is triggering a heart rate that is appropriate for the patient's needs, that the leads are working, and that the battery's strength is adequate. Health care professionals should ascertain the type of pacemaker employed and expectations for its function based on its NASPE/BPG code; monitor the cardiac rate and rhythm for evidence of pacemaker function; assess the patient for evidence of pacemaker failure or noncapture (vertigo, loss of consciousness, hypotension, chest discomfort, dyspnea) and evaluate the patient for effects on cardiac output; teach the patient technique and rationale for monitoring own pulse rate and for care and protection of insertion site; and counsel concerning telephone monitoring check-up, battery replacement, medication regimen, physical activity, and follow-up care. 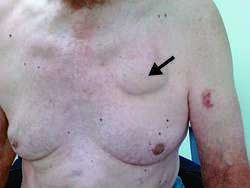 They should encourage the patient to wear or carry medical identification and information indicating the presence and type of pacemaker implanted, along with an electrocardiogram rhythm strip showing pacemaker activity and capture. Patients with artificial cardiac pacemakers should avoid MR imaging.